3.1 Compatible with all sonsorless brushless motor. 3.2 Use top quality electronic components to enhance the current endurance ability of the ESC. 3.6 Proportional ABS brake function with 4 steps of maximum brake force adjustment, 8 steps of drag-brake force adjustment and 4 steps of initial brake force adjustment. 3.7 With 9 start modes (Also called "Punch" ) from "Soft" to "Very aggressive" to suitable for different tracks. 3.8 Multiple protection features: Low voltage cut-off protection for lithium or nickel battery / Over-heat protection / Throttle signal loss protection / Motor blocked protection. 3.9 With 8 steps of timing adjustment to get the best compatibility with various of motors. 3.10 Easily program with only one button and compatible with pocket-sized program card. 3.11 The ESC is USB supported. 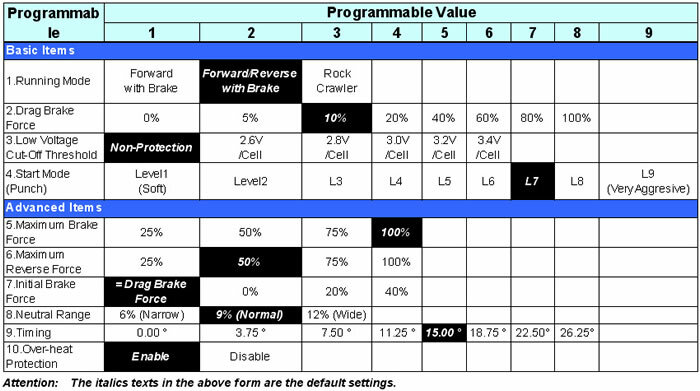 The firmware of the ESC can be updated through an USB adapter on the Advanced LCD Program Box (Optional device).